Bet y’all haven’t seen this one before. 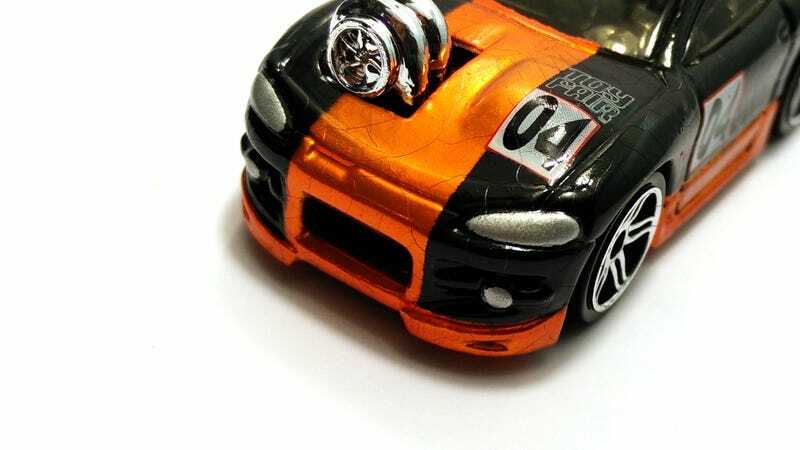 It’s a Hot Wheels Tooned Mitsubishi Eclipse, 2004 Toy Fair Edition. I did not attend the toy fair nor did I go on the internet to get this one. I actually received this from one of my best friends whose mother used to work at Mattel. I ended up with possession of this one (and a few other exclusive models) because he doesn’t care for diecast. To pass it on, I’d like to share it with you guys at LaLD. I don’t know exactly which toy fair this is from, and probably neither does he, but what I can do is give you guys some up close shots of this piece. From the lead photo, you can clearly see the paint degrading from age. It must be the Spectraflame or whatever it is that they used on this. It’s been in the casing pretty much its entire life (in fact, today was the first time I’ve successfully yanked open the acrylic case to get this photoshoot done), but that hasn’t prevented the paint from cracking all over the bodywork. When I received it some 8 or 9 years ago, it was already in that state. Thankfully, the paint hasn’t fallen off and still looks good from afar. I dislike tooned cars in general, as does everyone else, but the colors really make up for the casting. Of course, it’s got the huge fart can exhaust in the back to go along with the turbo sticking out the hood. Would’ve been cool to see some Real Riders on this thing like they do with Toy Fair models now, but I won’t complain. Keep in mind this is year 2004 stuff, and the models they make today are far more attractive. Some more shots because I know you guys love Tooned cars. So, is it time to bring back Tooned cars? Nah, I’m just kidding.